Mandy Ridley | Fleeting Focal Point – artist profile for Indesignlive, October 2009. 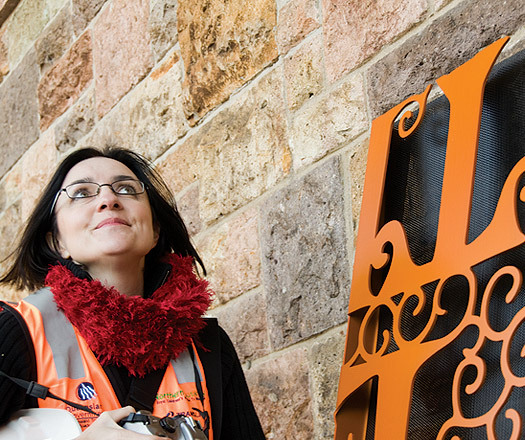 Brisbane artist Mandy Ridley brings new life to the city’s Busway Project. Indesignlive online article by Jesse, 8 October 2009. For Anonymous, Northern Busway Alliance – Busway Heritage Interpretation Project. Bowen Bridge Road, Herston, Queensland, 2009. You wouldn’t think it, but it was a 70-year-old wall in Herston, Brisbane, which was the inspiration for Mandy Ridley’s beautiful roadside installation entitled ‘Anonymous’ – a collaboration with Urban Art Projects. 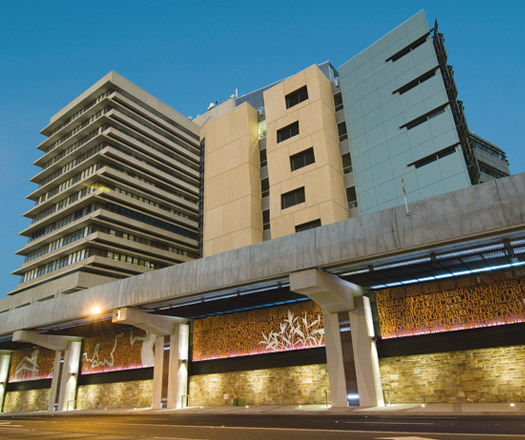 The historic porphyry wall boundaries the Royal Brisbane Women’s Hospital (RBWH) and is the central focus for Ridley’s work, which stretches for more than 100 metres. Ridley describes the project as a “multi-disciplinary” exercise. “We had weekly meetings with architects, clients, heritage personnel and more, problem-solving to implement my vision for the project,” she says. 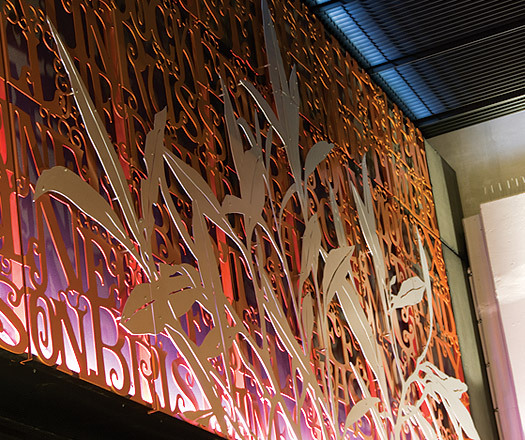 Set across a series of six bays, ‘Anonymous’ reflects the local region’s history through vivid imagery, such as the ornate lettering which has been laser-cut from aluminium and anodised into a lustrous golden “burnt orange” hue. 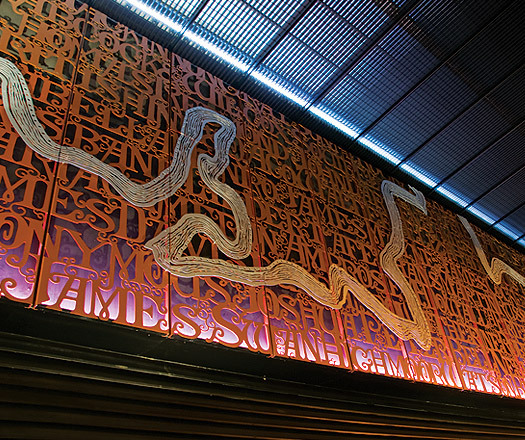 The elaborate letters comes together to spell the names of dozens of donors, drawn from RBWH’s donor boards. These form the backdrop to six images, each of which “symbolise key themes which have impacted the hospital and surrounding region’s history”. An archway reflects the arched entrance to Bowen Park; a silhouette of three local nurses (drawn from State Library archives) references the long hospital history; even the Brisbane Refidex (dated 1924) makes an appearance! 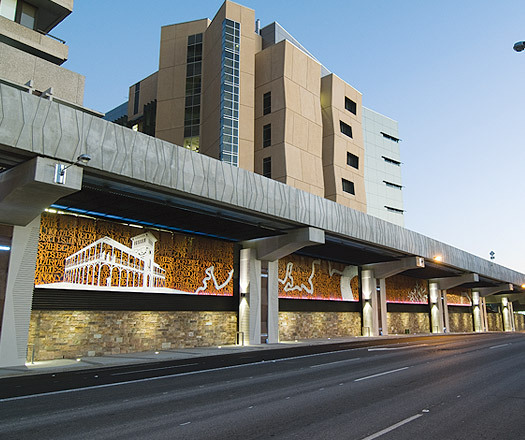 And, thanks to HASSELL project architect Robert Keen, the artwork has been seamlessly integrated into the site. 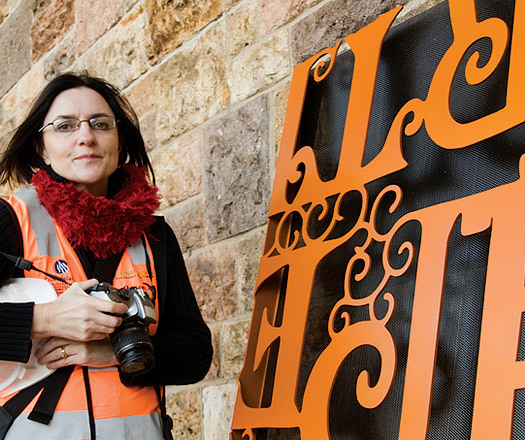 Ridley is well known for her public installations, which can be found across Australia. While ‘Flow’ (2009) – a laser-cut, powdercoated aluminium surface commissioned for the Darwin City Waterfront Project – has been one of her largest to date, ‘Anonymous’ (as Ridley describes it) has been the most “ambitious”. Drivers-by can see ‘Anonymous’ as they cruise down Bowen Bridge Road, adjacent to the new Northern Busway.